Dec. 1, 2015, 12:16 p.m. 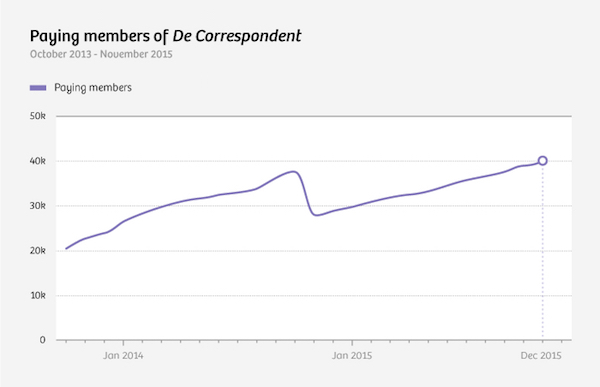 In the two years since it began publishing in the fall of 2013, the Dutch news site De Correspondent has signed up 40,000 paying members, the site said Tuesday. De Correspondent launched out of a crowdfunding effort in 2013, which saw about 20,000 subscribers pay €60 annually to support the site and access its journalism. It raised $1.7 million through that campaign. By last September, the site had signed up 37,000 members, but that fell by about 40 percent by the end of September when it came time for members to renew their subscriptions. Our retention rate for people who joined at later stages is much higher, as the renewal process for all post-crowdfunding members proceeds automatically. We now enjoy annual membership renewal rates of 79% after the first year, and our monthly membership renewal rates have reached 89% after the first month. We are proud to have such a loyal group of paying members. Once they’ve signed up, readers will receive the email newsletter from Editor in Chief Rob Wijnberg with a selected article from the past week. He emphasizes in the newsletter that the Correspondent owes its very existence to paying members. Last weekend alone, the conversion rate of newsletter recipients who become paying members was 1.8%. With a population of just about 17 million, The Netherlands is a small and affluent country that’s seen a number of paid journalism startups succeed, but it’s unclear whether the approach would work in the much larger English-language market where there’s more of a variety of free options for readers. Still, De Correspondent is going to make a go for it beyond The Netherlands. Early next year, the site said it plans to expand internationally. It’s begun translating some of its stories into English, and it’s hiring an engagement editor to grow its English-language audience. Lichterman, Joseph. 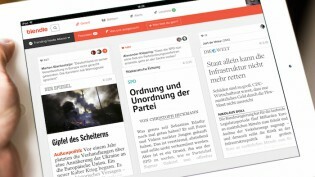 "Dutch news site De Correspondent has signed up 40,000 paid members." Nieman Journalism Lab. Nieman Foundation for Journalism at Harvard, 1 Dec. 2015. Web. 24 Apr. 2019. Lichterman, Joseph. "Dutch news site De Correspondent has signed up 40,000 paid members." Nieman Journalism Lab. Last modified December 1, 2015. Accessed April 24, 2019. https://www.niemanlab.org/2015/12/dutch-news-site-de-correspondent-hits-40000-paid-members/.